Professor Vladimir Lisichkov was the first president of the rugby club. Mr. Marian Valchev Director of DZI Bank. The President is now k Eng. e. pp. Danail Papazov. participation in national competitions during visits to play two matches. OSK to include "Residential-Spartak. Head coach of the team is Plamen Kirov. 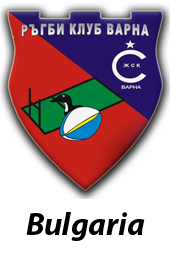 SKR 5 years of Varna is an associate member of the Atlantic Club of Bulgaria. International initiative with the Association of rugby center of Varna.